I just finished reading Millionaire Women Next Door by Thomas J. Stanley, Ph.D. and became intrigued with Stanley's references to income statement and balance sheet affluence. As a business major who has worked in financial analysis and accounting (and someone who is more balance sheet than income statement oriented! ), I bonded to these terms immediately. Those who are income statement affluent earn a relatively high income. Depending on the salaries and cost of living in a particular area, what is considered affluent in terms of annual household income could range from $100,000 to $250,000. According to Sentier Research, the median annual household income in the United States as recently as June 2015 is $55,132 so certainly being affluent in terms of income would mean exceeding this figure. Balance sheet affluent represents those who have acquired assets that far exceed their debts and liabilities. Your balance sheet is your net worth, which can be calculated by adding assets such as your savings, investment holdings, and home equity less car loans, student loans, credit card debt, etc. According to the United States Census Bureau, the median net worth of Americans in 2011 was $68,828. Again, you'd likely need to have a net worth over this amount to be considered affluent. For example, if you are 40 and earn $75,000 per year, you should have a net worth of $300,000; those who are balance sheet affluent should have a net worth of $600,000 or more. Of course, there are many factors associated with the ability to build wealth, ranging from heavy debt load from student loans during early income-producing years, job loss in a recession, medical crises or disability, etc. The point is that income is just one determinant of wealth; the ability to save and invest is the other. Superficially, becoming balance sheet affluent should be easier if you are income statement affluent. After all, wouldn't you be able to save more and invest more if you had a higher income? In his book on millionaire women, Stanley focuses largely on high income-producing women (mostly business owners and sales people) and their wise use of money, which translated into extraordinary savings. But he suggests that average earners can accumulate wealth. Stay-at-home moms who manage the family finances, for example, can apply their capabilities to controlling costs and making wise investments. Educators who are frugally minded also have a strong tendency to build balance sheet affluence. So, the balance sheet rich tend to fall in one of these categories: 1) they are income rich but don't behave affluently or 2) they have a small or average-sized income but have been able to develop a strong balance sheet because of financial discipline and investing prowess. One consistent finding of my research over the years is the connection between occupational status and wealth. Within each homogeneous age and income cohort, there is a negative relationship between occupational status and net worth because it takes a lot of money to maintain the consumption lifestyle that is compatible with high occupational status. For example, an attorney, real estate agent, or investment advisor may need to display artifacts of wealth in order to build credibility and confidence among potential clients. They may need to wear designer clothing, drive luxury cars, rent upscale office space, participate in charity galas, etc. in order to seem financially successful and professionally capable. Further, those with more prestigious careers may also find that behaving frugally does (or could) detract from their status in the community. 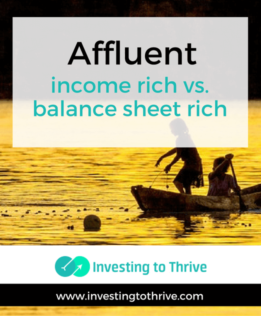 The balance sheet affluent often have under-the-radar careers that allow them to generate relatively high incomes without having to maintain an exterior of affluence. repair items rather than buying new clothing, furniture, etc. Overall, they are disciplined in regard to spending and investing. Plus, they tend not to buy luxury items, whether houses, cars, boats, etc. Stanley's research into millionaire habits, which has appeared in books like The Millionaire Next Door: The Surprising Secrets of America's Wealthy and Millionaire Women Next Door: The Many Journeys of Successful American Businesswomen, has helped to change perceptions — just not as much as I might expect. I think many people know that having a high income and having a strong balance sheet are two different things. Still, there seems to be a persistent disconnect between understanding that high net worth is not linked solely to high income and bonding to the idea that taking specific actions (like investing regularly) could potentially result in balance sheet affluence. I won't say that I can diagnose and treat this problem. But I have learned that abandoning the pursuit of prestige (and its expensive trappings) in order to pursue building your personal balance sheet can be worth the effort.